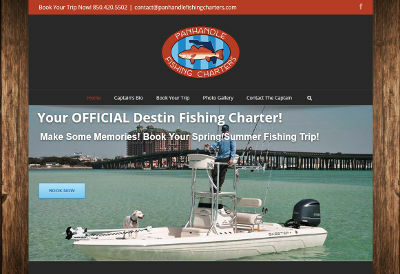 One of our website design freelancers, Sam Stebbins, recently completed a premium website for Joey and Mary, the owners of Panhandle Fishing Charters in Destin, FL. Sam took the time to meet with the customer to go over the details of their site, the features the site would include, and worked closely with them to ensure the site was setup how they wanted it. Over the course of about a month, work progressed on the site and the customers have now approved of the site for publication. We appreciate the work that Sam does for customers and the high level of work he completes. Panhandle Fishing Charters’ website is at panhandlefishingcharters.com.